We returned yesterday and wanted to let you know about our trip. It was wonderful. I am so glad that we used your expertise to plan our holiday in the Galápagos Islands. The ship, the Alya was outstanding in its amenities. Our room was spacious, clean and modern. The balcony was a bonus where we could sit and look for sea animals. While we ate breakfast, our bed was made and then in the evening the bed was turned down. Fresh towels when needed and lots of filtered water. The staff was exceptional. They were efficient and extremely hospitable. No keys for our rooms, but a locked safe in each room. Never once worried about it. The food was delicious and plentiful. Lots of options for everyone- fish, chicken, beef, lots of veggies, salads, Ecuadorian specialties and a different dessert twice a day. Buffet breakfast and lunch and served evening meals. We enjoyed a barbecue on our last evening with the meal served under the stars. Soda pop was included if you wanted. Our National Park guide, Carlos was top notch. He was very knowledgeable and accommodating to questions and requests. I understand that the guides move about with different ships, so either we were very lucky or Royal Galápagos requests the best. When we were in the panga, the guide and crew made sure we were safe at all times. They always helped us into the panga from the catamaran or the water. They never mocked my less than gracious manoeuvres, at least in front of me. They also kept vigil while we snorkelled and kayaked. The boat provided full wetsuits (not shorties) and we kept the suit and snorkels for our entire stay. Each time we needed our equipment, the crew helped us gather all our gear. We saw almost all of the animals that we wanted to see. The itinerary took us to a variety of environments. My favourite was Chinese Hat. Our highlight were the sharks..or maybe it were the sea lions..or the whales..or the oyster catcher birds marching along the beach. Lots to see everyday. Thanks, Kim for finding the best fit for us in every way. 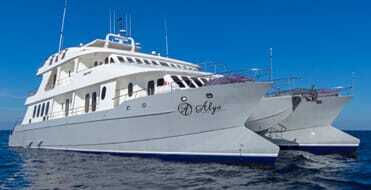 Riley and I had a trip of a lifetime in the Galapagos on board M/C Alya. Thank you so much for arranging the trip on relatively short notice. Although the accommodations and service were almost luxurious, this was no pampered trip. We were challenged every day (always within our physical limitations) during excursions up rocky cliffs, hiking across primitive landscapes, and snorkeling in warm clear oceans. M/C Alya is an 8 cabin, 16 passenger sailing catamaran, with crew of 10 including a chef, a hotel manager, and our dedicated naturalist Renny. Each day started early with buffet breakfast at 7am, followed by a morning hike to one of the islands in the Ecuadorian National Park where we focused on a species or two unique to that island. These excursions were designed for photo opportunities within meters of the wildlife. Each hike was followed by a wetsuit snorkeling opportunity from one of the zodiac boats that took us in close among the reefs. We then returned to the Alya for a great lunch and an hour’s rest before repeating the morning sequence during the afternoon. Each evening before a table service dinner, Renny provided a short lecture on what we could expect the following day. I was very impressed with the crew’s ability to provide comfort and safety to such a diverse group of guests ranging from 20 to 72 years of age in varying degrees of health. There was only one safety mishap when a guest stumbled on a hiking path and fell into a cactus. All of us pitched in to help with tweezers and she recovered nicely. Several passengers were concerned about the potential for motion sickness (and I do believe some precautions are warranted) but no one became ill.
"Galapagos - Alya Cruise - quite exceptional. The boat is impeccable. Our cabin was on a main level VERY spacious. Upper deck cabins were much smaller. The crew was working hard to ensure that all details were taken care of. We did see other boats including Majestic. Alya seemed to be the best from what we have seen. Compared to Majestic the size was smaller that allowed for fewer people on shore, and better experience overall. Española was my favorite part of the trip. Alya is HIGHLY recommended..
"The Alya was Awesome! There is no way you can do better than this Catamaran. It was like we were on our own personal yacht. Crew and Guide (Maria ) spectacular. "Hi Patricia, We finished our cruise yesterday and it was amazing, just wanted to say thank you again for helping us to organise it! We'll write a TripAdvisor review once we get back to the mainland. Just wanted to let you know what a marvelous time we had on our 8-day cruise on the Natural Paradise! The ship was perfectly designed and well laid-out. The crew were fantastic - we were particularly impressed by how quickly they learned all our names and preferences for food/drinks. In addition, all the crew helped out w/ all tasks as needed, especially to ensure we got on and off the panga's safely (even the captain helped!). The food was another highlight - every commented on how good and varied it was; also a different dessert for lunch and dinner for 7 days was particularly impressive! We also appreciated the snacks after each outing, matched to whether we were cold from swimming or hot from hiking. We also loved our cabin and the balcony where we spent many evenings watching the beautiful scenery go by. James. the naturalist was absolutely outstanding. He managed the group very well, was an excellent resource and teacher, and always put our safety first. I knew that the naturalist would have a big impact on our trip and I don't think we could have found a better professional to guide us for our Galapagos adventure. Ann Hardy and Mark Eberhardt"
We have just returned from our trip. It was wonderful. 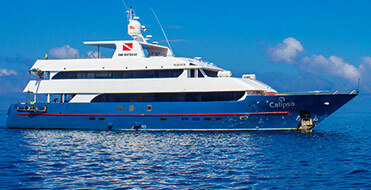 We would like to thank you and the Royal Galapagos company for the great experience we had during our adventure. The trip was very well organized, starting from picking us up a the Guayaquil airport and ending with dropping us at the Quito hotel. The cruise was beyond all our expectations - the gorgeous yacht, amazing cabin, attentive staff, professional crew, our tour guide Roberto, meals and excursions, and overall service. We were very pleased with our choice, and will definitely recommend you as a trip advisor and the Royal Galapagos to our friends. I’m on my way home to Minnesota after a wonderful time in Galapagos! It was a pleasure to finally meet you, and to learn about Royal Galapagos. The shore landings were beyond what I could have imagined. Beautiful, and the experiences were wonderful. The guide and crew were wonderful, as well. Very professional, taking care of everything, very attentive, and polite. The Food! I didn’t expect so much fresh salads, and fruit, and all the meals were delicious. Thank you again for the opportunity to take Natural Paradise! My clients will be very happy with their cruise next year. I also hope we can book other clients with you. 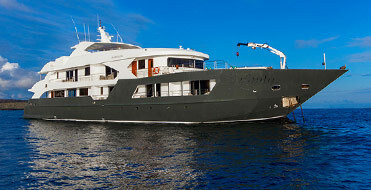 We look forward to working further with Royal Galapagos. "Wow. What a wonderful vacation…Galapagos was what we imagined and more. Every time I was on shore, I could not stop smiling from all the wildlife. I was in heaven. In the water, it was like snorkeling in a huge salt water aquarium. I felt like we were in a National Geographic special. One of the gems of the Galapagos was our guide, Lola. She was very knowledgeable of the islands and wildlife. Her enthusiasm was contagious the entire trip. The captain and crew of the Majestic were the best. We were spoiled the entire time on the boat. We had a wonderful group of fellow passengers on board. We have made new friends. We have decided that this trip is in the top three of all our vacations. The one thing I would suggest is that it is made clear that this is a very active trip and lots of places where not for people with walking problems. There was an older couple on board that had a hard time during entire trip. Jenny, once again, thank you so much." Sorry for the delay in responding to you here! 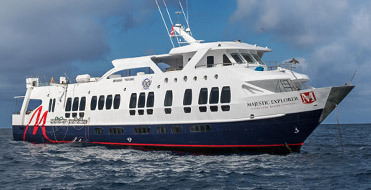 I was only able to inspect Majestic while there due to the other boats schedules, but I was really impressed with it. I especially liked the sun roof! I will certainly be thinking of it more often as a first class option! Beautiful boat. Thank you again for arranging the inspection! "Between the fact that I was raised by a half-Ecuadorian mother and my lifetime interest in evolution, the Galapagos Islands has always been high on my list. Barbara and I are living in Peru, so it became a matter of when, not if. In March, we started planning a short trip for our October break, so I started asking around and searching online. One link sent me to "Royal Galapagos," the cover photo of which was a gleaming white vessel, Majestic, with large port holes, sitting serenely at anchor at sunset. We contacted them; they responded quickly, and we hemmed and hawed for a few weeks, until a strategic email informed us that if we wanted to reserve a cabin on the main deck, we would need to act. We had to pay a sizeable deposit and I got a little nervous when the bank transfer seemed to go okay from our end, but not theirs, and I began to fear I might soon be smelling the sour stench of scam. PayPal ended up working okay, but cost us an extra 4%. When our reservation seemed to be set (Thank you for your patience, Elizabeth! ), we waited, and waited, grateful that we had acted early. By the time the trip approached, we had vouchers, itineraries, free reservations at a nice airport hotel in Guayaquil, free flight to the islands, pick-ups and drop-offs, etc. We were picked up, taken to the airport, handed boarding passes and more detailed information and practically escorted to the gate. By the way, the new Guayaquil airport is obsessively clean. There was nobody there, so the place was like some sort of white, shiny shrine with people pacing up and down the long corridor with mops, cleaning the floors. Anyway, we got the same treatment when we arrived. We had to pay $20 back in Guayaquil and $100 in San Cristobal for the park service. We had been aware of that and were happy to support the good work the park service does. The guides, Simon and Peter, who turned out to be the onboard naturalist, greeted us and before we knew it we were on the wharf. Off in the distance, the Majestic was moored. They have two very sturdy, very stable inflatable dinghies that make embarkment and disembarkment easy, supported by the sure hands of the boarding crew. Pretty much everything surpassed our highest expectations. What I had briefly feared was a scam turned out to be a well-oiled machine. Every member of the crew was professional, skilled, courteous, genuinely friendly, multi-talented, and all-around amable. These guys never stopped. Jonathan would serve breakfast, help us board, work on deck, etc. yet with every skill, he, like all of them, was on top of his game. The crew quietly brought our backs to our cabins during the orientation. We newlyweds of 37 years enjoyed the "Matrimonial Suite." Peter deserves his own paragraph. He has the build of a guy who runs up and down mountains - lean and mean - but there is no meanness in Peter, only a serious and multifaceted skill set. He is a walking encyclopaedia. He can identify a bird on the fly from 50 meters. He organized the itinerary to ensure the best chances of seeing wildlife and he managed time so effectively that we felt like we were packing in lots of action during the days, but not at a breakneck pace - we never felt hurried - and we still had a nice after-lunch siesta time before striking out again to some other amazing experience, where Peter knew we would see some animals up close. He was also thorough in his safety precautions and instructions. That first night, the crew lined up, decked out in their dress uniform best. Everybody introduced themselves and we had a champagne toast. Peter drew up a dry-erase board (every night) with the next day's itinerary, along with a detailed list of what to take along to each different place, and whether it would be a "wet or dry landing." Wet landings were never deeper than my knee. Decisions of which shoes to take led to generally less and less wearing of shoes. At night, the soporific combination of the salt air, the lulling of the hull, and the end of an active day was enough to soothe us to sleep. But the boat made the long hauls from island to island at night, so that when we woke up, we were there! That created a few issues. The sound of the diesel engine, blended with the sound of the waves in the wake, was not unpleasant. When weighing anchor, however, the somehow unpleasant sound of the chain dragging across the deck seemed to be just outside, or maybe in the same cabin. It took only a minute, but there was no sleeping through it. October is a season of choppy seas, and the nighttime passages were pretty rough if you were trying to walk around the deck. I ended up sleeping better than Barbara did. That first morning, I wandered out to the rear deck and gazed at the striped Wrasses slowly swimming through the clear water; then a large shark slowly made its way to the gunnel and beneath the boat. Breakfast followed, including fruit, frittata, huevos, cheeses, ham, breads, juices, and on and on. The quality of the food was actually amazing. One night Chef proudly walked in with a whole roast turkey! Every meal consisted of at least two gratuitous courses that were just too much to get to. The first day, after a morning snorkel off the beach at Post Office Bay, we arrived to a small buffet of fruit, sandwiches and juice. We thought it was lunch, but it was "morning tea." To our surprise, about an hour later, they served a full-on lunch on the top deck where the bar and jacuzzi are. We learned to expect a substantial snack after every trip off the boat. Pacing was key because it was all delicious, especially the unique fruits that I had never even heard of. Service was professional and we wanted for nothing. That the islands are amazing is such an understatement. There are no words for that feeling when birds hop or fly right up to you and seals and iguanas seem unaware of your very existence. It's like being invisible. We were lucky enough to see mating rituals of Albatrosses and Nazca Boobies. We walked among sea lions, barely a week old, hanging out on the beach with their mothers. We saw rocky shore boiling with brightly colored Sally Lightfoot crabs. In close to shore it was a casual buffet for the sea lions and birds. Turtles poked their heads up amid the feasting. We saw huge tortugas, strewn across a field like bales of hay. Snorkeling was hit or miss, but when it was a hit, it was a party. Sea lions considered us temporary distractions, nosing up to us and shooting past us. Unconcerned, Turtles slowly made their way past us. We swam in the midst of schools of brightly colored tropical fish of a range of sizes, swirling around the ancient sunken caldera called the Devil's Crown. In swim-through caves, White-tipped sharks patiently lurked, occasionally taking short, smooth glides along the vertical rock wall. This is meant to be a review, not a travelogue, but suffice it to say, there is nothing like it. If you want to see a few different islands, a boat is the way to go, because you travel at night and wake up at your destination (see note above.) I could not have been more impressed with the service, from start to finish. It's a little nerve-wracking to pay 100% up front for an unimaginable experience. I feel like we got 110% back." "We were on board the Majestic yacht for seven nights in February 2016 where we had an unbelievable experience. Captain Marcello and his wonderful team made our dream trip exceptional in every way. They were enthusiastic, so friendly, always smiling and nothing was too much trouble. They worked together as a team, helped us in and out of the dingy, and were very minded to our security. One day there was a birthday. We arrived back on deck late afternoon to find the crew had filled the dining area with balloons and were ready to make dinner a festive special birthday. I was impressed by the chef who managed to produce different dishes taking care of my food allergies of gluten and lactose. Billy our naturalist guide so professional, enthusiastic, knowledgeable and a wonderful caring person. We felt blessed that he was on board. He always was ready to share and answer questions however trivial. We were not rushed and Billie gave us plenty of time to wait for the right moments to take our photographs. Hikes and snorkeling were simply perfect. He made every effort to ensure we had an unforgettable experience. I am not sure where to begin. The ship was beautiful. I loved the public space. Plenty of it. Jacuzzi was a little bit of luxury. On the top deck it would had been good if there had been more shade for the sunbeds. It got a bit hot on deck. The food was excellent with plenty of choice. The crew worked nonstop. They were friendly, helpful and provided a first class service. The crew certainly made my birthday a very special occasion which will be a birthday I will never forget. The cabins were small on the lower deck but cabin number 5 is the largest and we were certainly grateful for that. We were a little bit disappointed about the lack of information on their website. No idea if water was free (it was) they served juices which were also inclusive. It would have been handy to know that the boat supplied a hairdryer and some idea of the cost of drinks and tips. We did have windows on the lower deck just too high to see out! The window sill was useful as an additional shelf for personal possessions and clothes. Not a lot of space to store two suitcases. You can just about get them under the bed, just little bit of additional information proves very useful. The guide on board was extremely knowledgeable and flexible. We never felt rushed and he did his utmost to ensure that we fully benefited from each and every trip. The itinerary for each day was clearly laid out on a white board with what to wear and take. So well organized so we didn't waste any time. The islands visited gave us an excellent opportunity to see a wide range of sea life and birds. It was all so close and made taking photos so easy. It was amazing to wake up every morning to a different view and a new adventure waiting for us. The other thing we would have liked to have done on Santa Cruz was to spend a little more time shopping and a bit of time in the evening there to enjoy the street life and live music. We felt seven day trip was spot on. I am so pleased we didn't do a shorter trip as we got to see so much more and never once felt we had had enough. To travel so far, and to such a unique place I am pleased we made the most of it and did a full week. Having just returned from my Galapagos travel, I wanted to compliment your discerning management and staffing aboard the Majestic MV. Each member of her crew was professional, welcoming, courteous and helpful. The cabin was immaculately prepared and maintained; the meals were beautifully created and presented, and our phenomenal educated naturalist guide Peter helped not only my enjoyment of Galapagos but furthered my education and passion for your archipelago. My only suggestion is that you not change a thing! We have returned from the enchanted islands! But straight after we headed to Cotopaxi so we were Wi-Fi-less for a long time. We are still completely overwhelmed by the Galapagos! And there was so much snorkeling, often times two times a day! We played with sea lions almost every day and they are so curious and playful!! We saw so many turtles, sharks and even swam with the flightless cormorants and marine iguanas!!!! We fell so in love with the islands that we were so sad to leave, we even tried if we could stay on longer on the beloved majestic but it was of course full. The crew was amazing; and our guide Peter Freire phenomenal. We learned so much!!!! Everything was just perfect it was like living a dream. And to make everything even better; our whole boat wanted to snorkel at kicker rock so the crew and guide went out of their way to make it happen. So on the last day we were in the water at 06.00 am and got to swim with a school of sharks as our goodbye :). For us this was the trip of a lifetime that we never expected we could make, we are so thankful for all your help and making it a reality. We cannot thank you enough!! And although this was once in a lifetime we did decide that one day we will have to come back, it may take some time but we want to see it all one day. Again; thank you so so much! You made the number 1 highlight of our 5 months trip in South America a reality, so dreams do come true sometimes. We are sad we cannot say thank you in person, but we fly home tomorrow - and in our bags we can now bring along such precious memories. Our vacation was very nice. Especially the cruise through Majestic. Crew members of Majestic were excellent. Very polite and helpful and friendly. Especially a member named Jonathan who worked 12 hours every day and always had a smile on his face. Just had to let you know that my group loved their trip. From the guides in Peru to the ship and staff on the Majestic – everything was fantastic. Not one glitch or complaint. Thanks for planning a flawless trip -- I'm so thrilled it all went well!! As you may recall this is our second excursion aboard your Royal Galapagos vessel, the Galaven. As such, Victor is one of four Galapagos National Park Naturalists that we have had the pleasure of guiding our daily excursions. We would like to commend Victor's outstanding performance during our June 27 through July 5 Tour A expedition. His well refined English language skills compliment his vast knowledge of the natural wonders of each of the Galápagos Islands. His daily briefings were very well prepared, presented and informative. We were always up-to-date on what was planned for each upcoming day. Several times throughout the expedition Victor offered lectures to provide more depth to facilitate our understanding of the geology, flora, fauna, and wildlife we were encountering each day. Capping this Victor offered a capstone photographic and video production encapsulating our specific 8-day tour. It was very well prepared and presented. Victor has a welcoming demeanor and expresses both excitement and appreciation of the natural wonder we have come to know as the Galapagos. In addition, we sure appreciated Victor joining us for each evening's meal making himself available to answer our never-ending questions and offer more insight to the day's events. In sum, Victor is the best of the best and we appreciate him and Royal Galapagos! I wanted to say THANK YOU SO MUCH!!! We had the most amazing trip on the Galaven ​! I really appreciate all the help you gave us in planning the trip! My son had a fabulous time and we had a great time with all the people on the boat!! I especially LOVED ALL the crew and guides and Louis!!! Thank you again and we hope that one day we'll be back in The Galapagos!!! I just wanted to thank you once again for our perfect trip that we just completed. Everything went perfectly; the weather was wonderful, everything was extremely well-organized, our crew and guide were outstanding (and every meal was delicious), and we saw and did a lot of spectacular animals (I got a video while snorkeling with four sea turtles). The group of passengers onboard the Galaven with us was just the right size, and everyone was terrific. Your careful attention to my questions and great organization is most appreciated. Thank you again, and I will soon go on to TripAdvisor and Yelp to repeat this. "Thank you from the bottom of our hearts for the most wonderful week in the Galapagos Islands. Erick Ortiz and Geno could not have been better tour guides for us. Their knowledge, expertise and patience with us and the rest of guests was magical. Luis was wonderful as the cruise director and made us feel welcome at every point on the trip. We feel like we were very lucky to have the guests and crew for our B excursion. 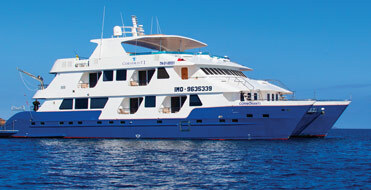 We cannot wait to save up enough money to do the A trip with Royal Galapagos. The accommodations were good. The food was delicious. The guests and crew were friendly and wonderful to get to know and the wildlife and island environment were out of this world. Thank you, again Patricia, for helping to make our experience the best vacation we have experienced. Please extend our thanks and gratitude to Erick, Geno, and Luis. I just wanted to take a minute to tell you that my husband and I had a WONDERFUL trip! The materials were waiting for us at our hotel, and the trip aboard the Galaven was fantastic. "My group of 4 had a wonderful time on South America! Your itinerary was jam-packed with a variety of locations and activities. Some days were more 'athletic' than expected, but we managed to do everything. All the guides were good, the Galaven yacht was good, every hotel was a unique, small, boutique style property in ideal locations, with very nice staff. Overall, it was a fabulous trip, thanks to your planning." We had THE BEST TIME on our vacation! The Galaven cruise was perfect from start to finish! You got everything started with your great communication and information about the cruise. We were able to fly in to Quito on Saturday night and we toured the city with a taxi driver all day Sunday. We rode the Teleferico to the top and viewed the city, we visited the Mitad del Mundo (original site) and also saw the new GPS accurate Mitad del Mundo museum (much smaller but the tour and scientific examples were terrific!). We also saw the beautiful volcano valley of Pululahua. It was a wonderful day of sightseeing! I'm just sorry we couldn't meet you (hopefully you were not working on Sunday anyway!). Our Avianca flight to SCY was great and we loved our one day and night sightseeing in San Cristobal (Puerto Baquerizo Moreno) before our cruise began. Then the best part of the trip was when we boarded the Galaven and met our wonderful crew. They were so accommodating and friendly and professional. In particular, our chef Senor Washington prepared so many delicious and delightful meals for us. Our boat drivers Wilmer and Augustin were excellent, our housekeeper Maria was wonderful, our cruise coordinator Luis was great and our 2 nature guides Pato and Xavier were terrific! Of course we owe our safety to our great captain Jose Figueroa and his mechanic Carlos, too! Everyone was absolutely delightful....what a wonderful crew! We filled out our comment cards and said lots of positive things about our vacation. The only negative thing I had to say was about the $50 fee for the wetsuits...considering the temperature of the ocean, I felt that the wetsuits should have been included in our cruise fee. They are a reusable item (like the mask, fins and snorkels) and do not have to be replaced after our use. I know that was a common feeling among the passengers---there should not have been a fee to use the wetsuits. 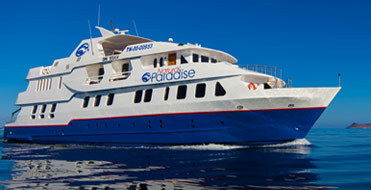 I hope to someday return to the Galapagos Islands and enjoy Itinerary A! Maybe in about 3 years we will be able to return. By then the new boat Infiniti will be in operation. Luis was telling us about some of the features of the new boat. Although the Infiniti sounds wonderful, I was absolutely 100% satisfied with the layout of the Galaven and the accommodations. Of course, we loved our cabins--#9 and #11 and we were happy to have such large windows to look out from! So, in closing, thank you for your great communication and for everything you did to get us signed up on our cruise and booked into such lovely cabins for the week. 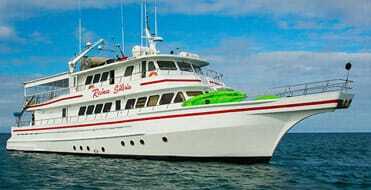 I wanted to write to thank you a million times for the wonderful trip to Galapagos on the Reina Silvia. It was the most tremendous trip my husband and I had ever taken. The yacht was fantastic, as was Cabin One, as was the world class crew and Franklin the naturalist. Many many many thanks. Gold medal! Number 1! Perfect Vacation! If there is a list you keep of interested clients for return trips please put us on it. It was just a fabulous time. 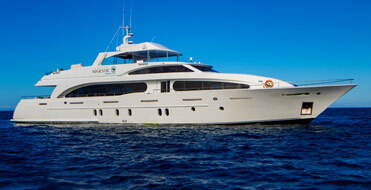 Now it's more than a week when we returned from the cruise on Reina Silvia. We got some time to get the impressions from the trip settled a little bit. We want to thank you, for this super trip. The Reina Silvia, the Crew the guide, everything was matching or exceeding our expectations. On top of this the support before and after the trip on the airport Quito whelped us a lot. To say it in one word. We are absolutely satisfied and will recommend the service of your company and the ship to fellow travelers.